I admit that I am a library junkie. My first crane placement was in the library that I basically grew up in (as in went there since my elementary school years). For as much as I frequent them, I had no idea that there were so many in my a county! I guess I got in a habit of just going to the one that was most comfortable and familiar. But there are so many wonderful little town libraries out there that I am just getting to experience. I full accept how much of a bookworm this makes me sound! 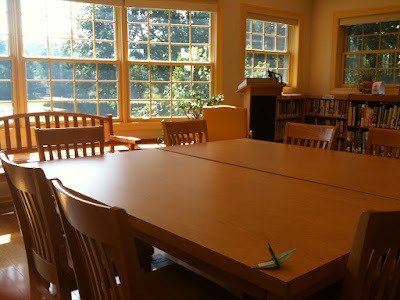 Do you have a favorite library you go to? If not, I recommend being open-minded and checking one (or several) out. This is one quality I really appreciate in people!